I just wanted to send the link to a relatively new Youtube video that shows EXCELLENT closeups of hand position and embouchure. It's the young flutist Helen McGarr playing Martin's Ballade. Fascinating to watch such a tension free performance. And great for those who learn fastest by seeing someone else perform at this level. Very "Inner Game of Music" to watch this video and then immediately pick up your flute and realize that you've absorbed the ease of the flutist you've just observed. P.S. Hear Poulenc first mvmt. by McGarr at age 12 here. Thank you Jen for sharing this perfect and interesting video. You are so very welcome you guys. 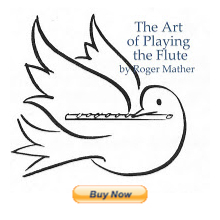 I seek great quality flute videos with great fervour, and am very rarely as fascinated as this. Helen McGarr played the Poulenc Sonata on NPR's "From the Top" (see link above). Knowing that she could play repertoire like this at the age of 12, I was fascinated to see her in this video at 16 yrs. of age. All of her musical efforts are relaxed, internal, no excess stress. If we observe players like this, using the principles of "Inner Game of Tennis", for about 45 minutes afterwards, we are able to play with her poise. This is why up-close videos of rehearsals and performances exponentially increase the human race's ability to play the flute. Thank you for your kind comments. I have a website now. It still has some work, but it is coming along. You can see it at www.helenmcgarr.com There are lots of recordings there. Thanks again for your encouragment! I went to your website and LOVE your mp3s. The Hoover is positively diabolical.